Our kid's Birthday Candy Bar Wrappers and Candy Bar Favors will put a smile on any child's face! Kid's today don't want boring, they want Chocolate! Make your child's Birthday Party the one everyone will be taking about. They will want to know "where did you get those fabulous Chocolate Bar Favors! Our designs are awesome, cool, boss, rad and we have a candy bar wrapper theme for everyone! Looking for a theme we don't have? Not a problem! Let us know and we can work with you to create a unique custom candy bar wrapper just for you! We offer FREE Personalization, FREE Customization, FREE Foil Sheets, FREE Digital Proofs emailed directly to you, and will even add a photo to your wrapper FREE! There is no SWEETER way to say thank you than with a delicious chocolate bar favor! Order the CANDY BAR WRAPPERS ONLY. We provide the SILVER FOIL underlay and PERSONALIZED WRAPPERS! *This is for the do-it-yourselfer. We do NOT provide the Hershey candy bars!! *Our wrapper/foil combo will fit 1.55 oz "Regular" Size Hershey's candy bars! *Assembly is required by customer *To sum it up: YOU buy the chocolate bars, YOU wrap the candy bars with silver foil provided then wrap with your custom personalized candy bar wrapper. Order the fully WRAPPED CANDY BARS. We will do the work for you! 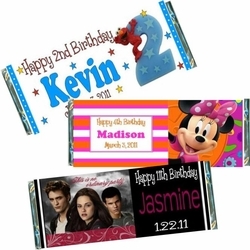 Your child's birthday favors will arrive to you all ready to hand out to your guests. You will receive a PROOF of your wrapper before we print your order. We can add a PHOTO to your Candy Wrapper FREE. After you place your order just email us your photo. We will email you a proof of your wrapper for you to see FREE!